Gerry Arbuckle with his lifetime achievement award and new book, “Intentional Faith Communities in Catholic Education”. Fr Gerald Arbuckle, May 4, received a “Lifetime Achievement Award in Practical Theology”. 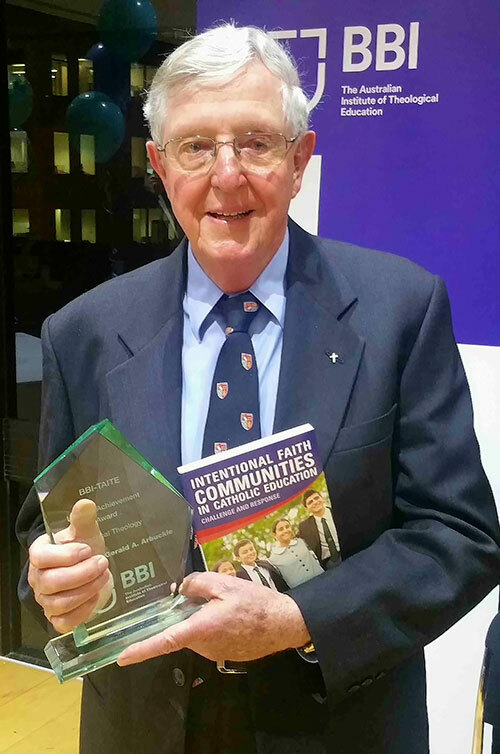 The award, presented by the Broken Bay Institute, Sydney, Australia acknowledges Fr Arbuckle’s application of the Gospel to contemporary local and global cultures. Professor Neil Ormerod, Professor of Theology and an international author, presented Fr Arbuckle his award, noting the award in Practical Theology is the first such award in Australia. has written over twenty books on Practical Theology for local and international readers. Speaking at the book’s launch Mr Ross Tarlinton, Headmaster of St Joseph’s College, Hunter’s Hill, Sydney expressed gratitude for the clarity and relevance of the book and its insistence on the complex cultural issues impacting Catholic schools. He emphasised the urgency to have principals of faith. In reply, Fr Arbuckle was delighted to receive the award. He explained the role of cultural anthropologists as helping to ground the Gospel and theologians in the complex cultural realities that are deeply, if not unconsciously influencing our lives on a daily basis. By way of example, Fr Arbuckle said it is only possible to respond to current issues such as fake news and fundamentalism in all its forms if the Church appropriately grasps the cultural causes of these movements. Quick-fix simplistic solutions are not the answer he warned. “So rapid is change in the world, and even in the church, that people fear their cultural and personal identities are under threat. They look for quick-fix simplistic solutions”, he said. to be revitalised, cultures need to re-own their founding story and apply it to contemporary needs. “We need to be culturally self-critical”, he emphasised. Citing the Catholic school he said that if Catholic schools are not vigilant, their cultures can still outwardly bear Catholic symbols but mindlessly drift into essentially secular institutions. Fr Arbuckle said it is vital for Catholic schools and all Catholic institutions to refound their cultures on Jesus Christ and his teachings. 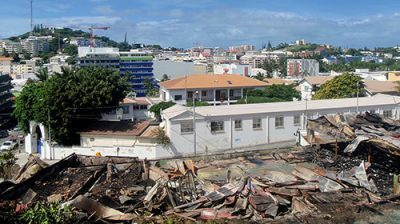 Fire destroyed a historic Nouméa Catholic Relief Services building early in the morning of 9 March. Built in 1932, the building was an integral part of the lives of many people, says Fr François Grossin SM, a priest in the adjoining parish. The former Cathedral parish hall helped many social activities including theatre, concerts, scout gatherings, sports, bazaars and multiple school events, he said. Noting the building was was famous for its library of books, more recently it was also used by “Secours Catholique” (Caritas International) for collecting and distributing food and clothes to the poor. Until the fire was under control the nearby presbytery was also evacuated. Officials believe the fire was deliberately lit. 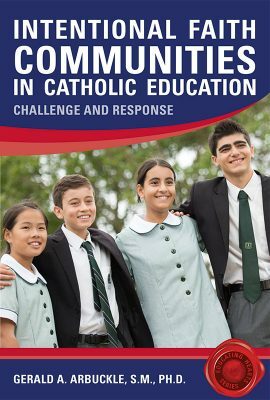 Schools as a communities where faith thrives and is effectively communicated is the focus of Fr Gerald Arbuckle SM’s most recent book. “Intentional Faith Communities in Catholic Education” explores key aspects of Catholic education. “Faced with immense pressures from prevailing cultures, Catholic school communities must always be intentional”, writes Arbuckle. “Principals, teachers, parents and students must always strive, deliberately and consciously, to nurture a culture in which individuals are supported and encouraged to grow as disciples of Jesus Christ”, he writes. Both practical and comprehensive, “Intentional Faith Communities in Catholic Education” lifts educators hearts towards possibilities for action within the Catholic school. Nicole Christensen principal of Monte Sant’ Angelo Mercy College, North Sydney, Australia labels the book a “must read”. “As a principal, it is a must read as we engage in the courageous style of leadership necessary for modern faith communities”, she says. Available on February 16, 2017, copies of “Intentional Faith Communities in Catholic Education” are available from St Pauls Publications. 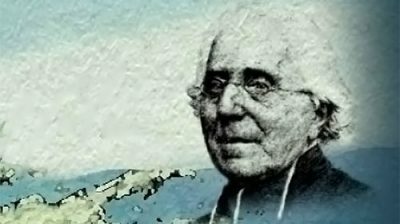 Earlier today, 26 January, a meeting took place in the archbishop’s residence in Lyons to formally open the beatification process of Fr Jean-Claude Colin, Founder of the Society of Mary. 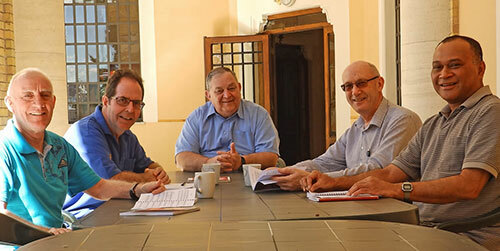 The meeting was presided over by the Vicar General of the archdiocese. Others in attendance were the Promoter of Justice, the Notary of the Cause, and three historical experts. The theological experts took their oaths of office in Paris. The Society of Mary was represented by Frs Bernard Thomasset, the vice-postulator, and Fathers Paul Walsh and Paul Loubaresse. After a welcome by Cardinal Philippe Barbarin, Archbishop of Lyon, Fr Bernard Thomasset delivered a presentation on aspects of Fr Colin’s work. The formal reading of the nihil obstat granted by three Roman dicasteries then took place, followed by swearing of oaths, some procedural matters and a time of prayer. The only Marist Fathers school in Spain has been transferred to the Marist Brothers. The process of transferring Sant Pere Chanel School in Malgrat de Mar was initiated by the Marist Fathers in April 2016 during a meeting at L’Hermitage. The Fathers’ intention is to ensure that the school retains its Marist character as a Christian school. 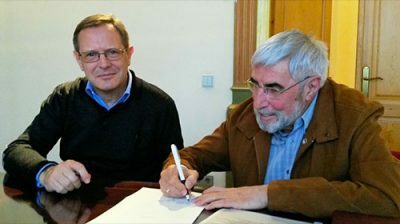 Writing on the European Marist Education blog, Marist Fathers’ Europe provincial, Fr Martin McAnaney, says he is delighted that the sustainability of the Marist educational mission in Malgarat is assured. The Marist Fathers’ Europe newsletter “Euro Info” reports the the transfer to Fundació Champagnat in Catalonia began with a ceremony on 15 December and will be implemented gradually in the current school year. Fundació Champagnat is a network of 9 schools and 15 social projects and “Euro Info” says future of the school is very promising. The Society of Mary was represented by Vicar Provincial Fr Jean-Marie Bloqueao, Provincial Bursar Joáquin Fernandez and the Society’s legal representative in Spain Fr Angel Antón.